This year on November 28th, 2019 multiply your good. All gifts to Father Joe’s Villages will be matched up to $65,000 for #GivingTuesday San Diego. As you know, San Diego is in the midst of a homelessness crisis and for many San Diegans, the end of homelessness appears to be out of reach. However, #GivingTuesday is a chance to show San Diego that you see things differently. This month, join the movement for hope. #GivingTuesday is a global movement that encourages people to do something positive for their community after Black Friday and Cyber Monday. On Tuesday, November 28th, become one of the thousands of compassionate San Diegans giving to local organizations. Plus, you can contribute even more through Cyber Monday on Amazon! Just go to https://smile.amazon.com/ and sign in. Choose Father Joe’s Villages as your organization to benefit and return to smile.amazon.com whenever you order something on Amazon. Amazon will contribute a percentage of the order to Father Joe’s Villages at no additional cost to you! Find more information here. How can I participate in #GivingTuesday? Father Joe’s Villages encourages #GivingTuesday participants to contribute to our mission to end homelessness by donating online. All we ask is that you consider making a small donation and encourage others to do the same. We are so grateful to Bob Killian, Kathleen Slayton and the law firm Peters & Freedman, LLP, David M. Peters & Shawn Morris, for providing us the opportunity to match #GivingTuesday donations. This means that for all donations made on November 28th, $1 = $2. This year, make your gift really count. 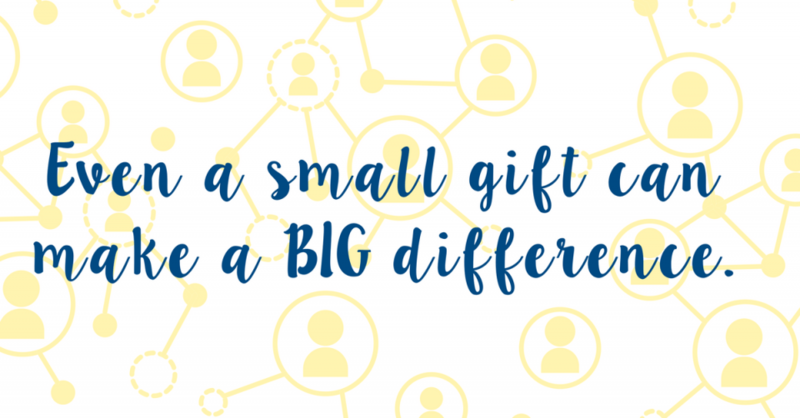 How will my #GivingTuesday donation make a difference? #GivingTuesday donations fund the life-changing services and programs that help our neighbors experiencing homelessness move off the streets and into homes of their own. Your donation can have a real, direct impact on the lives of our neighbors in need. Just $27 provides access to therapeutic childcare — $13.50 matched. $56 provides one night of housing and case management to a person who is homeless — $28 matched. $285 pays for one veteran to be fully trained, certified and ready for a job as a security guard — $142.50 matched. $412 gives one week of housing to a family of four — $206 matched. What else can I do to help end homelessness on #GivingTuesday? Spread the word through Facebook, Twitter or email to strengthen your impact. Imagine if 5 of your friends gave $5 each—and then the amount they raised was matched? Your post, tweet and emails could raise $50—Enough to help feed a child experiencing homelessness for two weeks. Let your friends know that for the same amount as a pumpkin spice latte, they can help a child access the tools they need to break the cycle of homelessness. It’s a small price to pay for a better future. Together, we can make a difference on #GivingTuesday.